Why Riot's MOBA still has the power to charm. I’ve been playing League of Legends for seven years. After over a half a decade, with thousands of games racked up, I still haven’t really tired of it. Granted, the history of this column is rich with me complaining about Riot and their game, but at the end of the day, like an overly critical parent, I complain because I care. In fact, I’ve been writing Rift Tales for one year now, and for my anniversary I thought it might be nice to explore why I stick with this game. League of Legends is constantly the source of controversy, discourse, and debate. Why do people keep sticking around for another helping of patch notes and updates? I grew up with exclusively Macintosh computers in the house. In the 1990s, this was a death sentence for pursuing any kind of digital PC gaming... except for Blizzard games. Sure, I had a Nintendo 64, and I loved Mario and Zelda, but I kept coming back to Starcraft. I loved the challenge, the struggle, the sense of progression. Ganon was challenging, but you could figure out his patterns and take him down in an afternoon. Mario had plenty of platforming puzzles and hidden stars, but the biggest hurdle to overcome was the controller. Starcraft’s opponents were far more interesting, and even when you beat one, there was a whole ladder out there for you to conquer. When I was sixteen, a boy brought over his laptop. He had something to show me, based off our conversations about gaming. He brought up a Starcraft match of Flash up against Jaedong, one of the biggest rivalries in esports. He had been hoping to transfer that viewing party into some makeouts, but I was more interested in the game. As he left, he sadly remarked that he was hoping for “at least a handie”. It was too late. I was in love with esports. I got into League of Legends at a friend's recommendation. It was the halcyon days of 2009, when no one had really figured the game out and the cast was a fraction of its current size. The game wasn’t polished, it wasn’t ready for pro play, and to be frank, it wasn’t even an attractive game at the time. These were the days when Riot legitimately was a small indie studio, and the servers went down so often that people who bought skins were commended for paying to help keep the lights on. It took me three tries to actually get into it, but the first time I successfully won a team fight and got a compliment from a teammate, I was hooked. Ultimately, this was what pulled me away from Starcraft and the solo queue ladder: you could play with people. The social aspect of League of Legends is one of its best aspects, and there’s a reason Riot loves to celebrate the people behind the game. 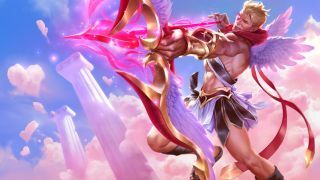 League of Legends can be tough to play with friends, but there are moments where everything clicks, you pull off the perfect combo, and you can feel a warrior’s bond forming. Also, let’s be honest, it feels spectacularly better to pull off cool plays over other people, not an AI. When I first started playing, champions ran around on pizza feet and sported very rough splash art that looked like they had been airbrushed on a side of a sweet van, photographed and then brought into the game. Once Riot started pursuing their art style with some degree of competence, everything still had a kind of generic feel. Female characters were the biggest victims of these early, amateurish attempts—most female characters were just some shade of hot, with the same body type, and the same face. Riot’s roster is now full of genuinely cool characters with, well, character. Old champions are regularly put under the knife to bring them up to the new standard, and fresh releases are really interesting, or at least have great ideas behind them. When I first started playing League, it was in spite of the visuals. Now, they’re one of the reasons I stay interested in the game. Ultimately, the reason I’m still in love with League of Legends is the game itself. League is fun to watch, and it's fun to play. It feels good to get a solo kill in your lane, back, and buy a big item. Winning a team fight, kiting a tank and watching him die, shoving down a tower... Riot has kept all of these things feeling good. While the game has been changed to be about teamwork over solo play, you still get a chance to shine... and if you don’t, you can try to stay in the game and help your team get ahead. Even the human stories and narratives I cover for League only work because of the game itself. Cloud9 against TSM was a fantastic series, but it worked because there was room for both teams to maneuver. TSM had the opportunity to come back in Game 5 by making an audacious play, and there was a back and forth between both teams. Watching a fantastic series of League is great, and it leads to an interest in the people behind the plays. One of the biggest questions about League of Legends is the game’s lifespan. Will it stick around for five or ten more years? It’s hard to say—Riot are certainly banking on the game remaining popular. I feel confident that the game has a few more years of gas in the tank. The core concepts are so strong, and the company behind them is continuing to evolve. I may complain about the game professionally, but I love League of Legends.